CARY, North Carolina (WTVD) -- It came to some as a surprise when the announcement was made Monday that the US Women's National Soccer Team will play host to Korea Republic in October. Lynn Williams of NC Courage, saw teammate Sam Mewis' face on Twitter, and realized the National Team will be playing in Cary on the Courage's home field of Sahlen's Stadium at WakeMed Soccer Park. Williams is one of four NC Courage players who are in a pool of players who saw time with the National Team in the Tournament of Nations last July. Midfielder Mewis (who was just named NWSL Player of the Week) and defenders Abby Dahlkemper and Taylor Smith are among Courage players hoping to be picked to be on the USWNT when they play against Korea Republic. 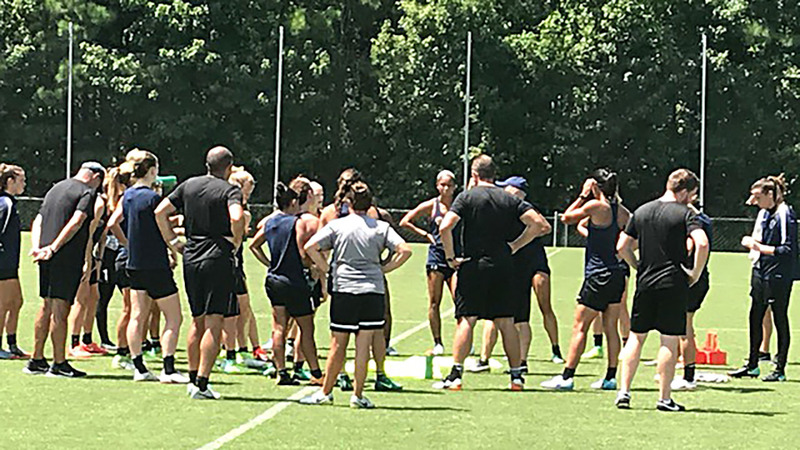 ABC11 caught up with the NC Courage players after their practice as they prep for the Washington Spirit on Saturday. Courage players Lynn Williams and Sam Mewis discuss the national team. The USWNT played host to Switzerland back in 2014 at WakeMed Soccer Park. That game drew a big crowd then. USA faced the Korea Republic in 2015, drawing 0-0 in Harrison, N.J. They'll face again at 2 p.m., Sunday, October 22 in Cary.